Sherlock Jr., despite being a short and silent film made from the 1920's, was definitely one of the most fun movies I've seen. It portrays a simple yet exciting plot in the couple of minutes it was on screen. From the beginning to the end, it surprised the audience in more ways than one. The movie in itself was already fun and funny, and the reactions that the crowd was giving due to the different quirks made it even more entertaining. In this movie, Buster Keaton plays Sherlock Jr., a projectionist and is also an aspiring detective. He is also deeply in love with a young lady who is also in love with him, and dreams of having her as his wife. 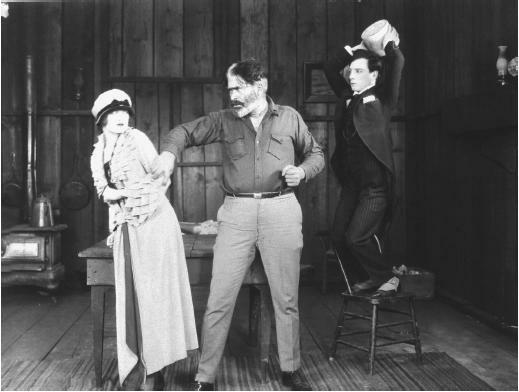 When he proposed to her, his main rival, a rich man, steals his girl by making Buster Keaton look like a thief in the eyes of the lady's father and family. He returns to his job and continues on despite his big disappointment. While projecting a film in the cinema, he falls asleep and begin to dream of taking the role of the detective in the film. Throughout the film, Sherlock Jr. goes through a series of events and situations (all happening in his dreams) that builds the whole story. At the same time, the lady he proposed to figures out the truth in the incident that happened and realizes that he was innocent after all. She goes to her father and tells him what she found out and ends up being with Sherlock Jr. Considering the year this movie was made, it was amazing to see how all the effects were shown. Obviously, much effort was done to be able to perfect all the tricks that we all enjoyed. The movie is filled with moments of entertainment from start to finish. In the beginning, the joke of finding a wallet amidst the trash was a great punch line to him trying to find money. Another funny trick was Sherlock Jr.'s "soul" coming out of him as he falls asleep, grabs his hat, and enters the screen. It was indeed the start of more jokes to come. At the same time, it is here where the reflexivity of the film was introduced. The point of which Sherlock Jr. is no longer the audience, but the actor of the film blurs the lines of reality and fantasy within the movie. It now showcased a film within a film brought about by a dream. Confusing as it may seem, it stirred more entertainment in the audience in the film watching, and the audience that is the class, or us. 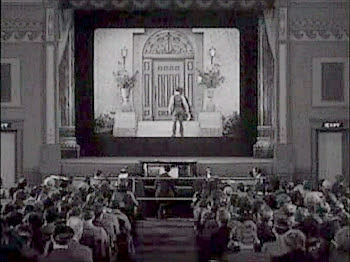 As the people watching the movie was watching Buster Keaton experience all sorts of gags and tricks in the most unrealistic ways, the audience watching from the class was observing both reality and fantasy going on. 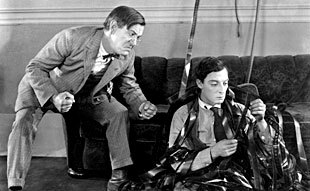 Everyone knew we were watching Sherlock Jr., the successful detective, was the dream or fantasy Buster Keaton as opposed to the Sherlock Jr. the projectionist. Yet, at one point or the other, it became confusing because he would look at his audience, but at the same time seemed to be addressing us as his audience and not the ones in the film. Even explaining it feels confusing. We are brought to think about fantasy amidst a supposed reality but was in fact also a fantasy compared to our real world. Again much more confusing. But, this is what brings the movie its brilliance. The scene of the billiards game is an example of this brilliance. Everyone seemed to actually feel that Sherlock Jr. would fall for the trick, but then, it so happens that the joke was not only on the "bad" guys but also on us. We were so attuned to the movie that it tricked us as well. Another scene that exemplified Buster Keaton's creative mind was when his character was fixing something by the window of the hideaway. It seemed very weird at the beginning because I didn't know what it was or what it was for. When he jumped outside the window as an escape and ended up wearing an old lady costume, I just couldn't help myself from laughing. All I could think about was how brilliant that trick was. Despite the fact that obviously it could not happen in reality, I actually wanted to try it just for the heck of it. And of course, there was the scene of Sherlock Jr. riding the handlebars of the motorcycle and not even noticing that no one was already driving it. It was so entertaining that it didn't even occur right away how impossible this actually is. Reality check: the motorcycle should not be able to move without someone steering and driving it. Yet, this did not matter. We were all so engrossed with the film that we simply enjoyed every minute of it. From beginning, to the middle, and even to the end, Buster Keaton was able to entertain us and bring us laughter. Even in the end, as Sherlock Jr. wakes up and gets his girlfriend back, he retreats back to the film and follows the actors in it. Funny how as an actor, he would be imitating an actor in the film that was in his film. He follows his every move and in the end simply gets confused as to how he's supposed to imitate the scene with the babies. I believe it was a great ending to a great movie. Sherlock Jr. was one of those refreshing movies that takes us out of the context of our own reality, presents its own world, and the fantasies that occur in it. It not only entertained us but also made us go through a roller coaster of events and fantasies that are not necessarily disturbing but would boggle the mind. It was creativity and innovation at its best (at least during that time). It's silence brought about not boredom but instead laughter and happiness to its audience. Not just the ones on screen, but also the ones in class. Buster Keaton was able to extend and reach out from his film throughout time and maybe even space by being able to affect us through this movie. Sherlock, Jr. threw me in for a pleasant surprise. It was charming, clever, and most of all, genuinely hilarious. The gags were orchestrated seamlessly with a punch of style and panache, the plot was tightly-constructed, and the humor was not at all dated — in fact, it felt refreshing in so many ways — despite the film having been produced in the early 1920s. Never in my life have I laughed so much at a comedy that was devoid of sound and purely physical in nature. Very much like the first film, The Man with a Movie Camera, Sherlock, Jr. reveals the powerful ability of the camera to construct a certain kind of reality. The use of montages and illusions — tricks which can be easily achieved through the use of the camera and the subsequent editing of filmed footage — shows that even the most fantastical impossibilities can come to life in the realm of cinema. … or situational, where in a series of hilarious but unfortunate events, the budding crime detective is ironically implicated by a rival in a crime he did not commit, causing him to be banished from his love interest's home forever. … and enters the movie that was being projected by the "real" Projectionist himself. This creates a film within a film, a device which further contributes to the reflexivity in Sherlock, Jr., as it self-consciously addresses the movie's fictional aspect. And I guess this fantasy part of the film is incredibly important. It highlights that life is in itself crippled by so many limitations, hence there is a need to enter the world of fantasy, where anything and everything is possible. … he is no longer a lowly theater operator taking detective lessons from a book, but is Sherlock, Jr., one of the greatest detectives of all time. The Projectionist, now living the life of Sherlock, Jr., attempts to win for himself the woman of his dreams. Slapstick comedy is still present in the story — such as that incredibly hilarious game of billiards and that strange yet genius chase sequence — yet the film's shining comedic moments heavily rely on the use of cinematic illusions. I was particularly impressed with the scene where he remains stationary within an enclosed frame while interacting with locales that were continuously changing. Through the power of editing, he travels through space and time, counteracting every moment of crisis with ingeniousness, may it be from crashing waves or boulders falling from great heights. I also loved that sequence where he leaps through a woman's stomach and disappears. The timing in that scene was just perfect — but to this day I can't figure out how that could've possibly happened. … and he finds himself confused as to how to replicate the film's conclusion where the movie couple ends up with a set of twins. It's a great commentary on the influence that cinema exerts over viewers — how we expect reality to live up to idealized film situations. But once the credits roll and the lights are back on, we are, like the Projectionist, confronted with the task of facing reality as it is. Visual Semiotics, a Shot-by-Shot Breakdown of the Dream Sequence in "Sherlock, Jr."
A Google Books Preview of "The Theater and Cinema of Buster Keaton"